So my first lesson in bike maintenance was learning how to use the quick release to take out both wheels and to put them back again. So after me and wife packed my new bike in pieces into the car, we rushed to my high school reunion for which we were already running very late. By the time we finished with it and reached back home and lugged the bike up to our 4th floor apartment, it was well after midnight. We put back the wheels just like we were taught. The rear wheel with the derailleur was tricky, and I had to go on the net to see closeups of derailleurs to figure out how to drop the wheel over the chain links into the socket. So far so good. We got the bike up on its legs. That was when we found out that something wasn’t right. The front wheel wont move when I tried to rotate it. Upon close inspection, I found out that one of the brakes was touching the rim and would not come off even after releasing the brakes. We weren’t prepared for this test! The only way out of this mess at 2am in the morning is the Internet, of course. So off I went surfing about. I remembered this one site with nice videos for bike maintenance, and thank god it had one beautiful video about V-brake maintenance. Beautiful video angles, to-the-point coverage, just perfect. I soon discovered that the very last of the adjustments shown in the video was what I needed – a really small innocuous screw pointing out near the brake shoes. It managed the brake arm tension, and was responsible for pulling the arm away from the rim. I remembered someone had fiddled with my brakes on my way back home when I was showing it to them. In any case, I tightened this screw and like magic, my problem was solved. Here is that life saver of a video: http://bicycletutor.com/adjust-v-brakes/. 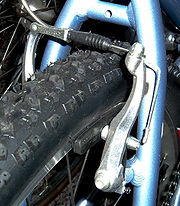 I later found out a very detailed article on V-brakes by the God of cycles – Sheldon Brown. From his very well illustrated article I learnt that my problem was known in the cycle world as a brake centering problem. He had a nice illustration, which I have displayed above, of the screw I needed to adjust to fix the problem. In any case, that night ended happily. The crazy couple as we are, we took the bike down 5 floors to our basement. I cycled around happily in our car parking at 3 am till wife was about to pass out from both the exhaustion of the day, as well as from watching me go round and round in circles. We finally lugged the cycle back up five floors, and called it a day.